It was a sweltering January afternoon in Madras, India. The year was 1978 and my friends and I were in the monastery of Sri Ramakrishna, the great saint of modern India who lived in total God-consciousness. Ramakrishna did not care for fame, power, or worldly prosperity. Ecstatic states were his norm. His mission was to demonstrate that each individual soul is immortal. He saw all religions as many paths leading to the same goal. God is one, he taught, and the way of self-knowledge (jnana), combined with devotion (bhakti), is a possibility for anyone who earnestly studies the teachings and is willing to apply them in their daily lives. In Madras it was easy to feel the sacredness at every turn, even in the Vedanta bookshop where we were buying yoga books to lug back to the United States. I took a time-out and walked the cool halls of the monastery. Passing a cozy office, I saw a smiling monk, robed in orange, sitting behind a desk. He welcomed me and invited me to sit down. “I teach hatha yoga,” I replied. I was stunned. Here I was, sitting in the birthplace of yoga. How could we in the West possibly take the great message of Sri Ramakrishna and other ancient luminaries any further? Today, as I recall that afternoon in Madras, I am touched by the swami’s humility and kindness to me—a neophyte yoga teacher from Cincinnati, Ohio. And as I look back over the past few decades, I realize the swami was right. We have taken the ball and run with it in countless ways. Visit any one of the growing number of yoga studios in the United States, Canada, and Europe. One center offers meditation classes, another teaches hatha yoga in a very hot room. Doctors recommend yoga for their patients. Celebrities and athletes practice yoga. Yoga is used to sell everything from milk to mattresses. Outwardly, yoga seems to be taking many shapes, and doing asana with a partner is one of them. Because I find some of the new shapes yoga is taking misleading, in presenting this article, I want to honor the common thread that transcends culture and time. Partner yoga is a continuation of what yogis have done since time immemorial: investigation, self-study, experimentation, and more self-study. Partner yoga is for everyone. Be creative. Experiment. It is often easier to practice with someone of similar size, although doing partner work with someone who is a different size offers an opportunity to be creative and to come up with different variations. Adjusting your asana practice around variables is part of the adventure that is yoga. Many of the partner yoga poses offer an opportunity to practice a technique I call “the three Rs.” This is a PNF (proprioceptive neuromuscular facilitation) technique that involves alternating isometric muscle contraction and passive stretching. The three Rs stand for Resist, Relax, and Restretch. Before stretching a muscle, you tighten it and push against a fixed object—in this case, your partner. The subsequent stretch becomes longer, deeper, and far more comfortable than holding a static stretch. Three of the following poses incorporate this technique, with guidelines given for each. There are many advantages to working with a partner. For example, it simply feels good to be physically supported by another human being. Plus, working with a partner allows you to experience the subtleties of an asana, which you can then recapture when practicing on your own. The “receiver” can concentrate on sensation and awareness as well as on the details of alignment, observing the posture, and breathing. The “helper” is there to provide support, check the partner’s form, and provide friendly feedback. Teachers sometimes ask me what to do if a student is uncomfortable with touching or being touched. Like all forms of practice, partner yoga is what you make of it. I often invite a student who is uncomfortable to partner with me, and in a large class I might ask the women to pair off and the men to work together. In working with a partner, take care to honor his or her space. Come into it slowly and with respect. You are there to assist, not change, your partner. Injuries can occur when the helper thinks he or she can change the receiver or tries to “force” a position. I encourage partners to talk quietly to each other. The receiver must be in control of the final position, and not the other way around. Self-awareness and respect for your partner are key components of this approach to asana. Resistance, the first R. Do not push too hard. This contraction is not a war. Remember: keep cool, calm, and focused. Relax, the second R. You both know how to relax. Give your partner a chance to pause. Let the body go limp, but do not collapse. Feel it happen and exhale. Restretch, the third R. Hold the final restretch position for the recommended time. Holding longer can overdo the stretch, which can cause injuries. Length of time to hold the final position will be expressed in breaths. An inhalation and exhalation equals one second. Six to 10 breaths equal about 30 seconds. Larger muscles are held for a longer time; short muscles, a shorter time. When using the three Rs, do not let the limb that is being contracted move at all. Movement (bouncing, for example) reduces the final stretch, often significantly. 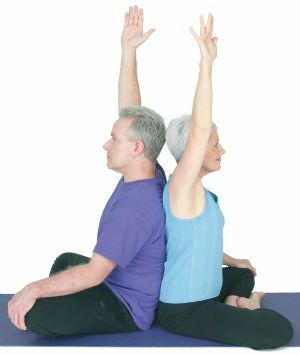 This is the perfect posture to begin partner work—it is quiet, comforting, and very supportive. We all know a lot about the nooks and crannies of the front body, just as we are familiar with the luminous face of the moon. But what about the dark mysteries of the back side of the moon? Or breathing from your back body? I call this Moon Breathing because it is an opportunity for you and your partner to sit back-to-back and explore the mysteries of the back body. Sit back-to-back, ankles crossed, backs touching. Close your eyes. First bring your awareness to the familiar front body. Practice three-part breathing: inhaling, the belly softens, the mid-ribs expand and fill under the collarbone. Exhale quietly from the top, middle, and lower lungs. Continue this effortless, seamless, three-part breath for one minute. Now switch to the unfamiliar. Inhale from the tailbone up the back spine, feel the sacrum, expand and breathe up through the back ribs, feel the skin and shoulders widen like warm wings, pause…then exhale. The breath cascades from the back of your skull, slowly down your spine…neck…mid-back…tailbone. Breathe in a comfortable rhythm with your partner.Take your time, eyes closed. Picture a full moon reflecting its light—a golden pathway upon the dark ocean. See and feel the waves of breath as they roll in and slowly out. Continue Moon Breathing for 6 to 8 breaths. Yin tip: Doing the three Rs before the final pose helps release the tight layers of abdominal fascia. Your comfort and ease in the twist will improve. Still sitting back-to-back, both you and your partner raise your right arms toward the ceiling. Then reach back and place your right hand on your partner’s left knee. Place your left hand on your own right knee. Inhale, and lengthen your spine. Exhale, wring out your spine to the right in unison (toward your outstretched arm). Hold for 3 seconds. Resist. Without moving the hand-to-knee positions, do a little resistance by holding on firmly to your right knee, then pull left (in the opposite direction of the twist). Hold this gentle resistance for 4 to 6 breaths. Restretch. Exhaling, spiral slowly to the right, imagining you are moving all your internal organs. Keep your neck soft, turning your head to the right the very last. Hold the twist for 30 seconds, breathing comfortably. To finish, come back to center…eyes closed, feel the support from your partner…enjoy the inner stillness for one minute, and repeat the twist on the opposite side. Lengthening your hamstrings while lying down protects your lower back and is a comfortable way to do the stretch. Partner work adds interest, ease, and self-observation. Using the three Rs will make this stretch especially effective. The receiver (Kevin in the photograph) lies on his back, left leg bent. He extends his right leg up toward the ceiling as straight as possible, with his foot flexed. The helper (Nancy) stands behind Kevin’s right leg. 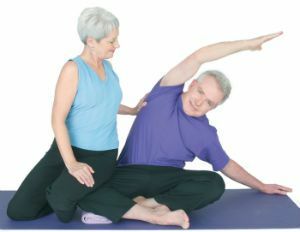 She tests the flexibility of his hamstring by holding on to his right heel and gently pressing it away from her until they both feel the first point of resistance. As the receiver, you are relaxed. Do not force anything. Listen to your body, and tell your partner when you are close to the edge of sweet discomfort (not pain). Resist. Nancy takes a wider stance, bending her knees for support. She guides Kevin’s right leg back to the starting point, then begins the resistance. She places one hand on top of his foot, and gently pushes her other hand into his right heel, holding for 3 to 5 breaths. Kevin then resists by pushing his heel gently and steadily back into Nancy’s hand, ignoring the urge to bounce. (This resistance will not work if you bounce.) He holds for 3 to 5 breaths (10 seconds). Relax. Kevin relaxes his whole body and breathes in. Restretch. On the exhalation, Kevin restretches his leg. Nancy goes very, very slowly. She lets Kevin feel the fibers lengthen and encourages him to breathe, relax, feel, and enjoy this painless and wonderful way to stretch the hamstrings. The restretch can be held for one minute. Yin tip: Before doing the Hamstring Stretch on the other leg, it’s interesting to see how far you’ve come. Nancy holds the right leg at its comfortable, maximum stretch position. Kevin raises his left leg up to the ceiling to its natural stopping point. The photo shows the difference. I hope you’ll feel encouraged that you can improve your flexibility today (not in three months’ time), and that the improvement will last with practice. This is a nice stretch to do after Tree Pose. It feels wonderful on the lower back muscles. Stand face-to-face, clasping your partner’s wrists. Step back, arm’s-length away, engaging all the arm muscles. With your feet hip-width apart, fold forward from your hips. Now pull back from the hips. Talk to your partner: Do you need more pull or less? Hold for 3 or 4 breaths. Walk your feet forward, and bend at the knees as though sitting in a chair. Bring your ribs to your thighs, and pull back from the hips. Hold for 3 or 4 breaths. To come out, keep tension on the arms, bend your elbows, and then straighten up. This is a classic yoga pose that helps you cultivate equanimity and power in an ever-changing world. A partner helps you feel more balanced and centered in the pose. It is helpful to use tree images as you hold the position. Imagine rooting your toes deeply into the earth and lifting your arms skyward like the limbs of a tree. Stand tall, side by side, with your hips 1 to 2 inches apart. Both partners bend their outside leg, placing the soles on the inside of their thigh, just above the knee. If it’s more comfortable, place your foot below your knee. Intertwine the inside arms, like branches of a tree, and raise them over your heads. Reach your outside arms across your chests, bringing the palms together in namaste. Now let your inside hips touch. Spread the roots of your toes deeply into the earth, standing straight and tall. If you fall out of your tree, try again. Benefits: Excellent stretch for all muscles of the side trunk. Adds ease and grace to Triangle Pose and all standing or seated side poses. The receiver (Kevin) sits with his legs folded, his right ankle in front of the left. He has placed a roll beneath his right thigh because it did not meet the floor. Sitting beside him, his partner (Nancy) slides her hip gracefully up, and rests her thigh across his thigh to hold his hip to the floor. Nancy places a hand under Kevin’s shoulder, assisting him to hold this position steady. Resist. Leaning left, with his left hand on the floor, Kevin pushes gently back into Nancy’s hand, using his waist and back muscles to press into the resistance. He holds for a few breaths. Restretch. Kevin must move into the restretch himself by extending his top arm out, leaning forward slightly, and letting himself go farther to the side. Nancy uses her hand to guide (not push) Kevin as he goes deeper into the pose. She reminds him to relax his shoulders. He holds for 3 to 6 breaths, then comes up slowly. Then repeat the entire sequence on the opposite side. Adapted from Lilias! 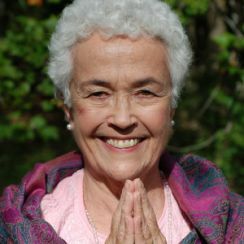 Yoga Gets Better with Age by Lilias Folan. Printed with permission from Rodale, copyright ©2005 by Lilias Folan. For more information on Lilias’s upcoming workshops and appearances visit www.liliasyoga.com. To learn more about her award-winning videos and DVDs go to www.naturaljourneys.com. 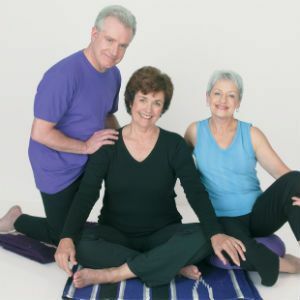 Models Nancy Glenmore Tatum, MS, and Kevin Patrick Casey, CMT, are directors of Glenmore Yoga and Wellness Center in Richmond, Virginia. Both are certified yoga teachers registered with Yoga Alliance.